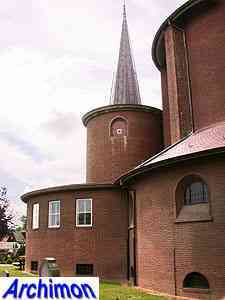 Architect A.J.N. 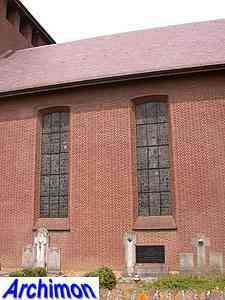 Boosten died in hospital unexpectedly on the second day of 1951. 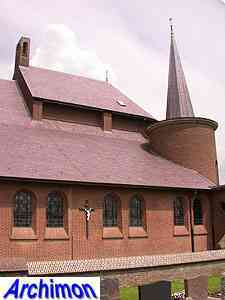 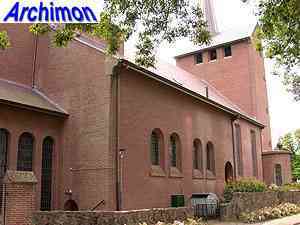 He had just finished several designs for much needed new churches in the province of Limburg. 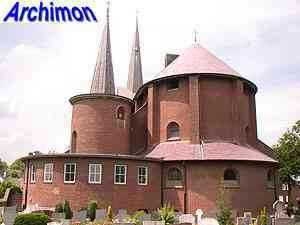 Other architects carried out his plans, including his son Th. 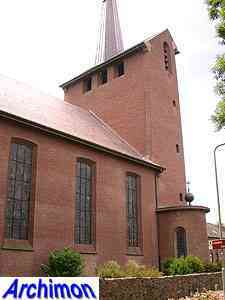 Boosten who finished this particular church. 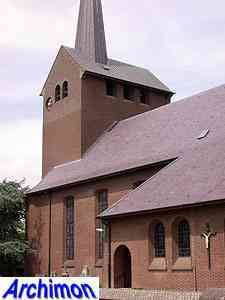 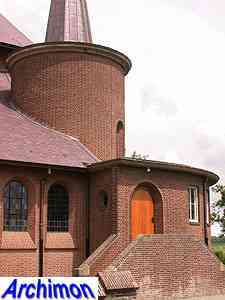 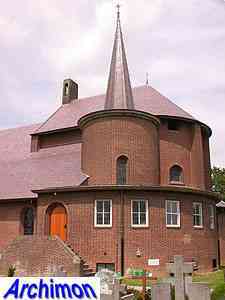 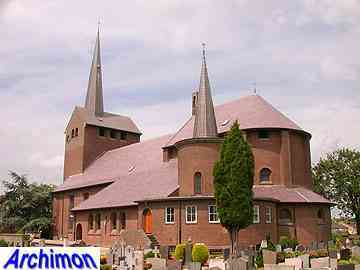 Compared to the radical H. Lambertus in Horst, often regarded as Boosten's best work, the church of Grubbenvorst is mostly quite conventional, although his style is clearly recognizable. 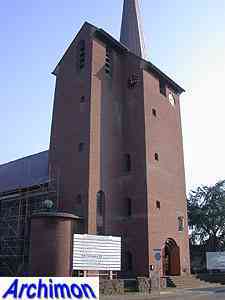 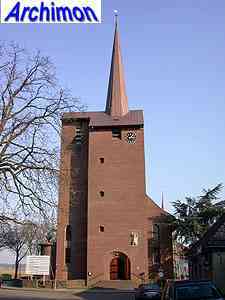 A wide, westwork-like tower, vertically divided in two parts, is covered by a saddle-roof and crowned by a tall polygonal spire. 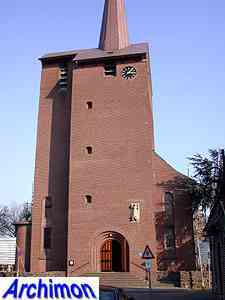 This tower was built in 1955. 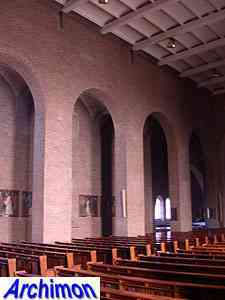 The nave consists of three aisles under one roof. 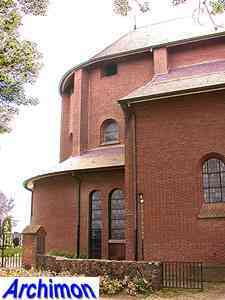 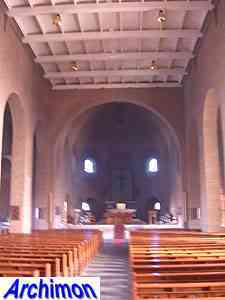 Next to the choir, which is a bit taller than the nave, is another shorter and cylindrical tower crowning a baptistry. 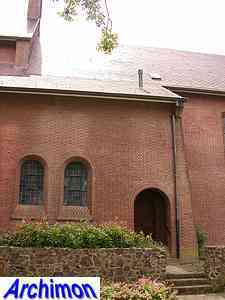 The interior is very simple, which is not unusual for a church designed by Boosten, and is hardly illuminated by the mostly small windows. 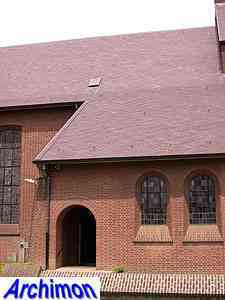 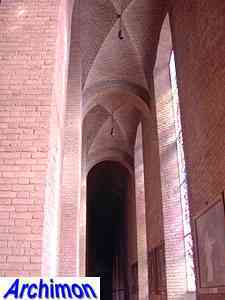 The narrow side-aisles, used as walkways, are covered by brick vaults, but the central aisle only has a flat wooden ceiling.